PHILADELPHIA – These trips home make Kobe Bryant his most introspective and nostalgic, deepening his understanding that the years are passing so fast now, time slip, slip, slipping away. He had gone back to see familiar faces in the leafy suburb of Lower Merion on Saturday, back to the high school where Gregg Downer still coaches the town's kids. Everything washed over Bryant this weekend. "It's kind of surreal now, driving around, going to the same pizza place I went when I was 17," Bryant said outside his locker on Sunday night. "Where the hell does the time go?" Seventeen years ago, Kobe Bryant was 17 years old and preparing for a prep-to-the-pros move that still seemed such a leap of faith. He has come back to this city and won a championship, been buried with boos and almost always used Philadelphia as a benchmark for how far he had come and still has to go. 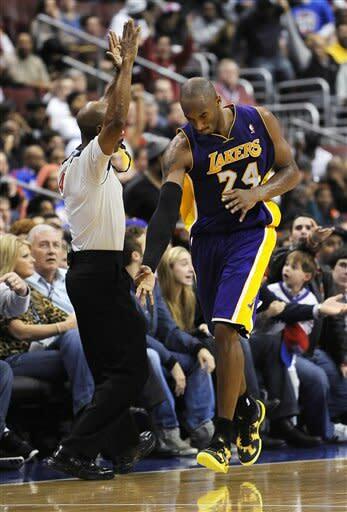 At 34 years old, Bryant had been brilliant on Sunday night with 34 points, six assists and four rebounds. 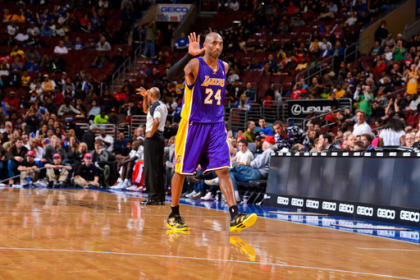 When the Lakers substituted him out with a minute left in a 111-98 victory over the 76ers, something strange happened here: In the Wells Fargo Center, most everyone stood up and cheered for Bryant. As much as anything, perhaps they had come to admire one of Bryant's greatest gifts, an ability to wear everyone else out, grinding them down, defying the passage of speed, strength and agility. "He really seemed to be taking it all in and cherishing it tonight," Downer told Yahoo! Sports. "He was waving to fans, more interactive than usual. He knows he may be back only a few more times." In Bryant's mind, maybe once more. The possibility of retiring when his contract expires in 2014 still looms large in his mind. He's weary of the toll that his rigorous workout regimens take on him. It isn't the winters that wear him out, but the summers. For Bryant, it took discipline to spare himself the sluggishness that always comes with eating a Philly cheesesteak on a trip home. "It's a lot, a lot of work," Bryant said. "My competitive spirit comes from like every little inch, your body is slowing down, the younger guys are passing you up. It really keeps me on edge." The Lakers are slowly, surely recreating themselves under Mike D'Antoni, awaiting Pau Gasol's return to practice on Monday and, perhaps soon, the true arrival of Steve Nash. The Lakers need Nash to connect everything and everyone here, need a thread to run through Bryant and Dwight Howard, Gasol and Metta World Peace. Bryant doesn't want to handle the ball so much, and he understands that changes when Nash steps on the floor. Within the locker room, Nash has made it clear that he has no desire to score the ball for these Lakers. He's running D'Antoni's system, and playing traffic cop between Bryant and Howard. Nash gives Bryant the ability to play off the ball, to get his points in different spots on the floor, different ways. Pushing past 30,000 points for his career, Bryant makes no apologies and no concessions for his ability, his love, to shoot the basketball. The ball moved crisply on Sunday night, and Bryant scored his 34 in a most efficient way. Across the past six games, Bryant has delivered at least 30 points a game – something only Michael Jordan and Kareem Abdul-Jabbar had ever done after turning 34 years old. "It's like the super heroes," Bryant said. "Superman could fly. Spiderman has his webs. Steve can pass. And I can shoot." It is still too early to count out these Lakers, to suggest Howard's mobility won't fully return, that Nash won't find a way to integrate Gasol into the offense, that Bryant won't stay on this torrid offensive spree into the springtime. These Lakers have a long, long way to go until they're championship caliber, but it won't be long again until they're whole, until they're a problem for everyone in the Western Conference. Near the end of a tough week back East, near the end of a nostalgic weekend in Philadelphia and a spectacular Sunday at the Wells Fargo Center, Bryant sat with his knee wrapped and his two feet deep into a bucket of ice. Nash sidled over to his locker, passing Bryant two basketballs and a sharpie to sign for a friend. As he scribbled his name on a ball, Kobe sighed and said to Nash, "We're old cats, man, old dogs." Nash responded, "But we've got a lot of tricks, though." Together, they laughed, and soon Bryant was on his way to the showers, the bus and a cross-country flight back to California. Yes, he had stopped to consider all the basketball that he had played since leaving Lower Merion High School, and the preciousness of what still awaits with what's left of his career. He had such a spectacular Saturday driving through that picturesque little town in the suburbs here, stopping to see his old coach and the kids on the team and even an old pizza joint. On the Lakers' bus ride to the airport, Bryant would email that, "I go back every year to remind myself where I come from." Where the hell does the time go, Kobe Bryant asked on Sunday night. Mostly, though, he seems to wonder: How much is left?